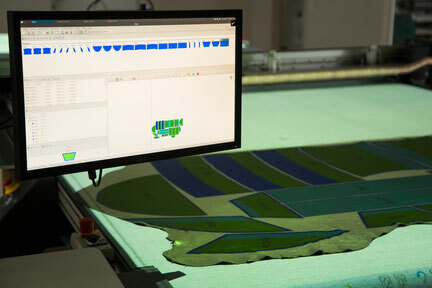 The nesting software CCUT by RG Technologies is used to control the complete cutting system. In simplified terms it contains the following functions: Creation of production orders and nestings that are sent to the cutting table for the purpose of cutting. RG Technologies has not only designed the complete hardware of its cutting system modular, but also the software. 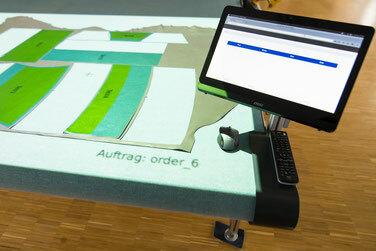 The software CCUT can be perfectly adapted to the needs of the customer. The application range of CCUT ranges from small-scale operation to series production. The user interface of CCUT was designed to facilitate the user to process the nesting of the present geometries as easily and quickly as possible. Training of personnel, subsequent to the installation of a cutting system is of short duration, due to the clearly arranged user interface. Productivity increases enduringly immediately after installation. The implementation of a complex cutting system must not necessarily take place in one step. The modules can also be implemented stage-by-stage in reasonable units. This shortens the training time and successful results through the use of the new technology are visible faster. Please contact us for more information on the modular structure and the individual components of CCUT. Depending on the customers requirement, CCUT software components can be used combined or separately. When installing a new component, such as CCUT Nesting, the cutting system can always be expanded very quickly and easily by further components. Order creation and manual nesting are the basis of the CCUT cutting system. The available functions are designed to achieve the highest possible efficiency of nesting. The geometries to be cut are placed visually on the material. Direction of pull, quality zones and other parameters are shown to the user. Due to operator’s experience, parameters can optionally be considered or ignored. The geometries that have to be nested are generally grouped in orders. The order types are divided into different categories as required. Starting with prototypes increasing to series production orders. The user receives the number of patterns to be nested and the information about the material that has to be provided for nesting. The allocation of the materials has been carried out in advance in the bill of material. 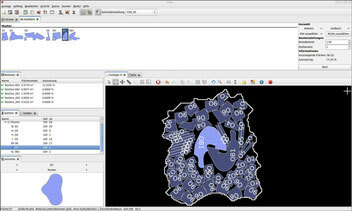 Geometries from external CAD programs can be imported via interfaces which are included in the cutting system. Special requirements are analyzed and implemented by the project management together with the customer. CCUT Stripe Nesting was based and developed on a customer requirement. The opportunity of nesting stripes on leather, under consideration of faults, was created with integrated functions. The main application of stripe nesting is in the production of welting. The specifications for the stripes are stored in orders, according to the conventional nesting. A special variant of stripe nesting is sheet goods nesting. In this case the system automatically defines the sheets excluding any faults. The automatic nesting CCUT Powernest allows the user to nest complete orders automatically in one step. Alternatively orders can be nested partial automatic. This can be done easily and intuitively via the user interface. Automatic Nesting can be used for processing sheet goods without additional modules. 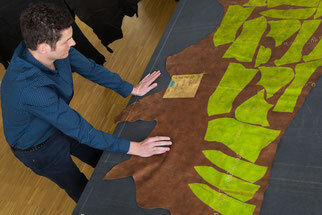 Irregular outlines as they are the case with leather require digital outline capturing. Depending on the materials used, the minimum distance between the geometries can be adjusted both in automatic and in manual nesting. It is recommended to use always the minimum distance, in order to achieve the best nesting result with the highest utilisation of material. RG Technologies can determine the optimal settings for the used material in its own cutting center. This happens in consideration of the material dependent parameters. The customers' production process is not disturbed. Immediately after installation, production can be started on the cutting system with the best settings. Send us your material. We will determine the optimal settings and send them to you as soon as possible. Digital outline capture can be done manually or automatically. For series production it is recommended to use automatic capture. RG Technologies uses commercially available camera systems. Darkening or an additional illumination of the work station is not necessary in a normal working environment. Outline capture can be integrated into already existing nesting stations and is thus retrofitted. Simple, highly accurate and efficient functions are available for the detection of material faults and quality zones, based on which markings are made very quickly. When separating the working step nesting from cutting, nesting of the individual skins and textiles can be loaded on the cutting table with the CCUT Position Detection. Optionally the position detection can be automated. The use of the CCUT Picking Device on the cutting table is recommended for small and similar geometries. Names and contours of the geometries are shown to the user, depending on the setting in various user-defined colors. This speeds up the process of picking immensely. Sources of error due to incorrect picking are reduced extensively.